Celebrating 25 years in the industry, the Aviation Suppliers Association (ASA), based in Washington, D.C., is a not-for-profit association, representing more than 640 global member companies. Collectively, they lead critical logistics programs, purchasing efforts, and distribution of aircraft parts world-wide. Member companies include: distributors, suppliers, surplus sales organizations, repair stations, manufacturers, airlines, operators, and other companies that provide services to the aviation parts supply industry. 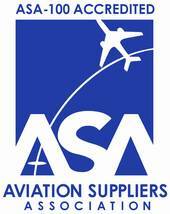 ASA's Board of Directors and Corporate Officers focus the organization's energies on regulatory and legal matters such as safety, international compliance, and ethical business practices that impact the aviation parts supply industry; along with market promotion of the distribution industry. As a result of the group's auditing capabilities, over 300 companies have received accreditation to the ASA-100 Quality System Standard and FAA Advisory Circular 00-56 since 1996. As the Association has grown over the years, so has the number of services it is able to provide to the industry at-large. The Aviation Suppliers Association Certification Body (ASACB), is an ANAB accredited certification body for ISO 9001:2008, AS9100, AS9110 and AS9120 audits. ASA also recognizes outstanding industry leadership and commitment with its annual Edward J. Glueckler Lifetime Achievement award. As one of the leaders in educational events, ASA provides a range of opportunities including, regional workshops, networking events, quality committee meetings, and its annual conference. The ASA Annual Conference is the only conference with a focus on the aviation distribution industry and boasts itself as one of the most informative and extensive training events, which also includes significant networking and business development opportunities. In addition, ASA has been recognized by the Federal Aviation Administration (FAA) for Database Management, for the Industry Voluntary Accreditation Program. On a global scale, ASA also interacts with and participates within working groups from government agencies including EASA, Transport Canada, CAAC, Australian CAAC, and many others. ASA closely works with several industry non-government groups.